Looking for a fast, easy, affordable, and nutritious lunch idea? 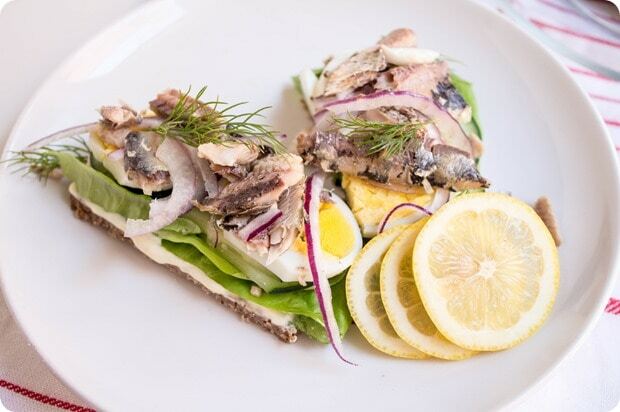 Give these Scandinavian Sardine Sandwiches a shot. Thank you to Chicken of the Sea for sponsoring this post! And they are good for you, too! Eating seafood, which includes fish and shellfish, at least two times per week (as recommended by the 2015-2020 US Dietary Guidelines for Americans) will reap plenty of nutritional benefits. 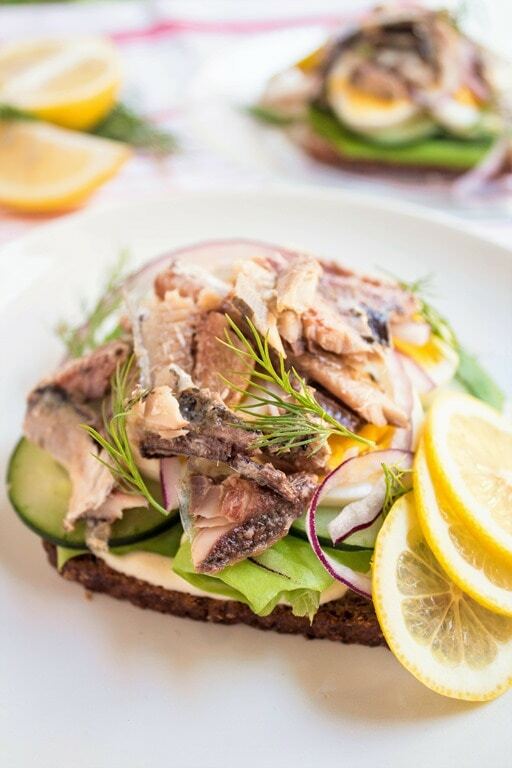 Seafood is not only high in protein, but also a great source of Omega-3 fatty acids, which support heart health and brain development and reduce inflammation. And as far as fish goes, sardines in particular are nutritional superstars! They are high in omega-3’s, contain virtually no mercury and are loaded with calcium (because of the tiny edible bones in the fish – a fun fact to gross people out with). They also contain B vitamins, iron, magnesium, phosphorus, potassium, zinc, copper and manganese – and they’re super cheap AND shelf stable. Total win, right? I usually buy sardines packed in water and add my own sauce to the mix, either mixed in with the sardines or as a spread on the sandwich or wrap I’m having with the sardines. 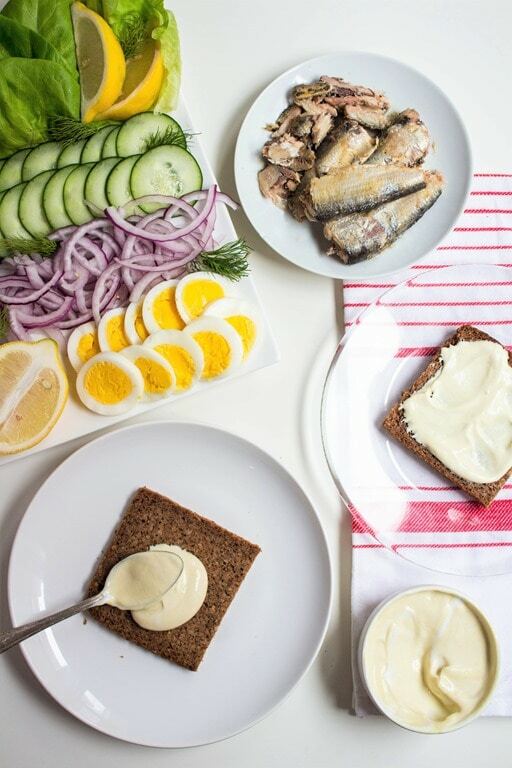 In the case of this recipe, simply mix together some plain yogurt and dijon mustard to create a creamy, tangy spread. Hot tip: regular bread works fine here (just be sure to toast it), but this recipe is especially delicious if you use European-style rye bread – the really dense, thin, seedy bread! It’s nice and sturdy and perfect for open faced sandwiches, and helps the bread to not get soggy if you pack this to go. Once your dijon-yogurt sauce is on the bread, layer on some lettuce, cucumbers, sliced hard boiled eggs, and red onion. And finally, add your sardines! Garnish with fresh dill and a hefty squeeze of lemon juice – such a yummy combo with fish. 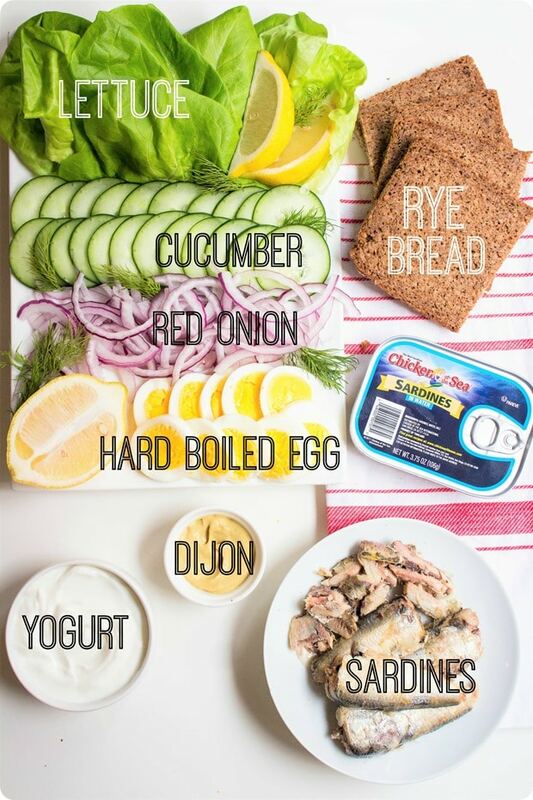 Mix together the greek yogurt and dijon mustard; spread on the bread slices. Top with lettuce, cucumbers, hard boiled eggs, and red onion. 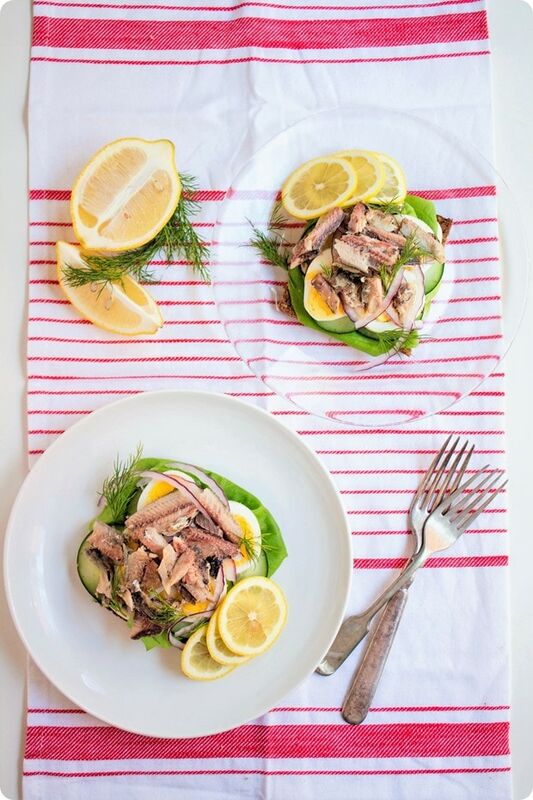 Top the sandwiches with the flaked sardines, then garnish with dill and squeeze lemon over the top. Chicken of the Sea® is helping fans stay healthy by eating more seafood in 2017! Each week they will share healthy tips, tricks, and recipes via their social channels and website – find them at www.chickenofthesea.com and on Facebook, Twitter, Pinterest and Instagram. Also, from now until March 15, enter their #EatMoreSeafood contest via the digital form on their website or Facebook page, or use the hashtag #EatMoreSeafood on Twitter or Instagram. 10 weekly winners will be chosen; each weekly winner will receive a $100 VISA gift card and a Chicken of the Sea Eat More Seafood resource deck of cards, featuring healthy tips, tricks, and recipes. Plus, a grand prize winner will win COS seafood for a year! Happy seafood eating, my friends – and let me know how you like the recipe! 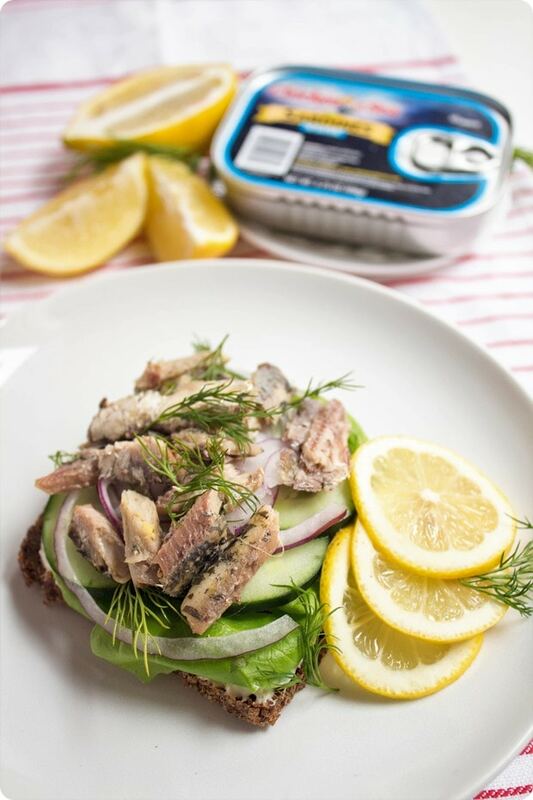 Are you a sardine fan? yum. I love sardines. I usually opt for the ones in mustard sauce. I may have to give this a try with the rye bread and greek yogurt/dijon smear. Interesting! I have never given sardines a chance because they have such a bad rep! This combo sounds really lovely though! Poor sardines! :) Give them a shot! Haha, yes! My bottom shelf is always filled with ALL the canned fish and sardines are the best! Haha love it – ALL the canned fish FTW! I LOVE sardines! Getting the ones packed in olive oil are life changing..the flavor is amazing. Trader joe’s has 2 kinds that I adore and Whole Foods has a brand is spicy pepper infused olive oil. Yum! I always put them on salads but never have tried a sandwich-thanks for the inspiration! YUM! Give me all the cured fish. Smoked canned trout from TJ’s is my everything. I’ll definitely be making myself a Scandy Sandy (sorry, I had to) sometime very soon. This looks fantastic! World Market has carried wild caught sardines in lemon olive oil that Matt and I adored. I would love to make this for us soon! Anne, this is the first time I’ve seen sardines look appetizing. I actually want to try them! Thank you! Are you pregnant? The only time I ate sardines and I mean I ate them often was during both my pregnancies! 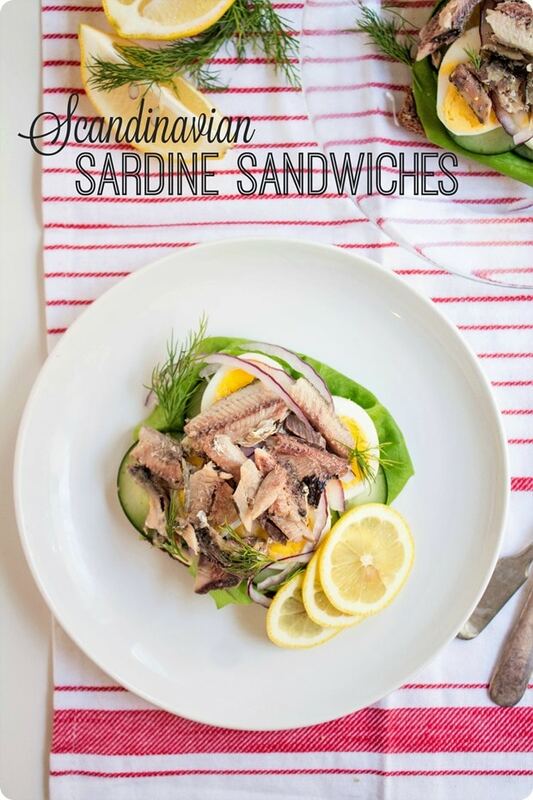 Well when you are, you will crave sardines even more! 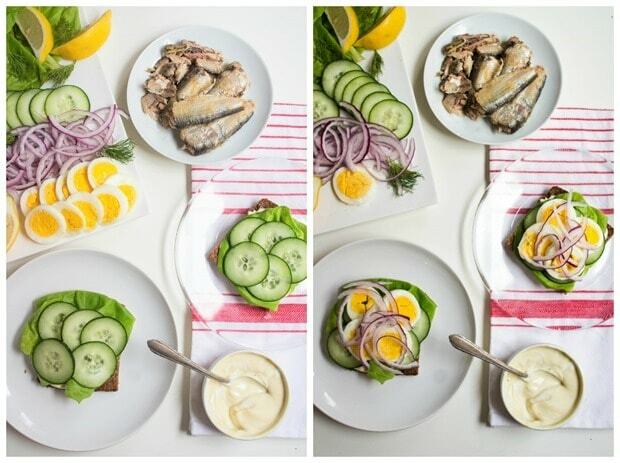 I love sardines… and anchovies! But I usually only eat them fresh or out of a glass jar, which tends to be more expensive, but I don’t mess around with my fish.